The VWR Vortexer 2 delivers dependable variable speed, in a hefty metal exterior that gives just enough weight to keep the unit from walking. The three-position switch on this vortexer allows for continuous action, or touch on control. The 10 levels of vortexing action of single tubes allows shaking from a gentle slow speed to an aggressive high speed vortexing and everything in between. The VWR Vortexer 2 comes with a flat, made of chemically resistant thermos plastic rubber that will accommodate nearly any size or shape flask and test tubes. A wide variety of accessories are available through VWR to accommodate nearly any tube or flask configuration you need. 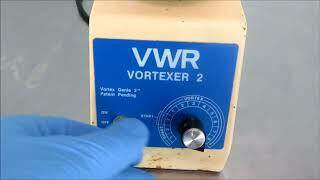 This VWR Vortexer 2 Vortex Mixer has been tested and performed to expectations. All of our lab equipment comes backed with our standard warranty. Should you have any questions, please don't hesitate to contact us.